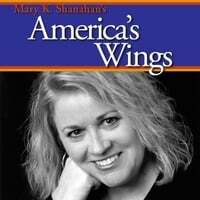 Mary K. Shanahan's compelling song America's Wings was recorded as a “dispatch” to her father, a World War II Navy Veteran, for mail call during his Stars and Stripes Honor Flight to the World War II Memorial in Washington D.C.
An inspirational singer-songwriter, Mary K. Shanahan's first radio release from her debut CD Child of the Chain™ charted into the top 20 nationally on independent Christian Radio. Three subsequent releases garnered national airplay, as well as international play on EWTN Worldwide Catholic Radio and Sirius Radio. She was subsequently interviewed and featured exclusively on Thom Price’s Artist Spotlight on EWTN, and was one of only two Catholic artists worldwide quoted by EWTN on the death of Pope John Paul II, along with Lech Walesa, former President George W. Bush, Rabbi Marvin Hier and the Dali Lama, among others. Her 2006 recording and release Jesus Wept aired for the first time on EWTN and Sirius Radio on 9/11 and remained the #1 download on Catholic Music Network for two months. The current Co-Chair of the Interfaith Arts Council of Austin, Shanahan has served as its festival's Music Director since 2005. Offering a juried art show and an eclectic music stage, the annual event provides opportunities for people of all cultures and faith traditions to seek commonalities and celebrate diversity through the visual and performing arts. Past music performers include Grammy and Dove Award winning Gospel artist Cynthia Clawson, international touring artist Ustad Nizami, Grammy Award winning singer-songwriter John Arthur Martinez of Nashville Star fame, Grammy nominated songwriter Beth Nielsen Chapman, acclaimed soprano Rabbi Marie Betcher and countless artists and dancers from various world religions and cultures. During her tenure, she also staged the Austin premiere of BYNA: Life Songs of a Southern Appalachian Woman of Cherokee Descent by Austin composer Rudy Davenport and lyricist Delilah Elsen. Shanahan is also a past two term President of the Austin Songwriters Group. During her tenure, she directed seven Austin Songwriters Conferences and established nationally recognized educational programs in the craft and business of songwriting, including the Texas School of Songwriting which was held each year with The Recording Academy®, ASCAP and Hamstein Publishing. She also secured major sponsorships with SESAC, ASCAP and BMI, and co-founded the Austin Songwriters Group's Songwriters in the Round, a monthly event, which showcased hit songwriters from Austin such as Monte Warden, Chris Wall, John Arthur Martinez and Darden Smith, with Nashville’s finest writers such as Brad Paisley, Billy Kirsch, Gretchen Peters, Gary Nicholson, Carolyn Dawn Johnson, Mark D. Sanders, Tom Douglas, Phil Vassar, etc.